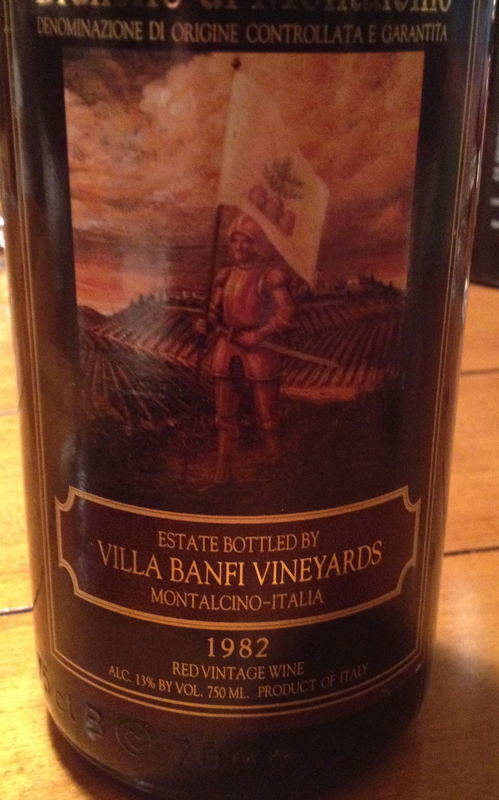 The Best Brunello di Montalcino!? Last year I was contacted by Riccardo Gabriele and Elisa Bosca of Rg Pr Vino, a PR company representing a number of Italian wines to speak about their wines at luncheon and meeting of wine journalists. They have an interesting portfolio so I agreed. 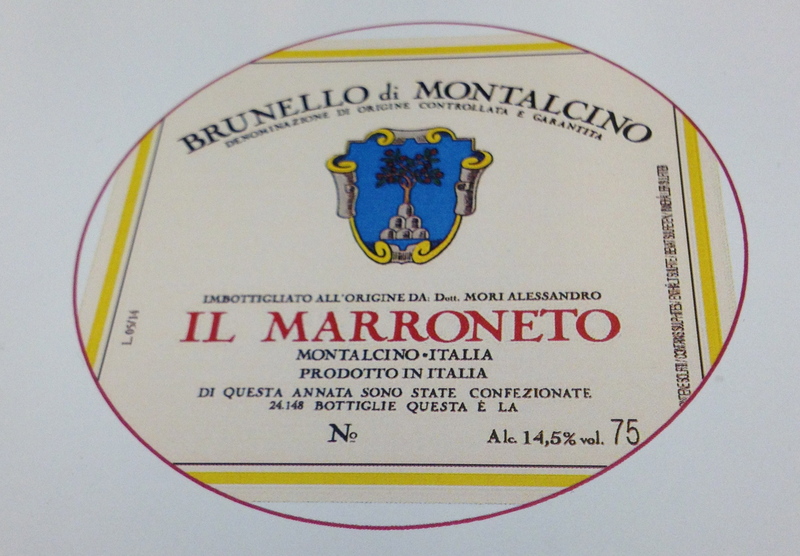 One of the wines I presented was the Brunello di Montalcino from Il Marroneto owned by Alessandro Mori. For me, it was the wine of the tasting and one of the best Brunellos I have ever had. Riccardo asked me if I wanted to take one of the wines home and this was my choice. 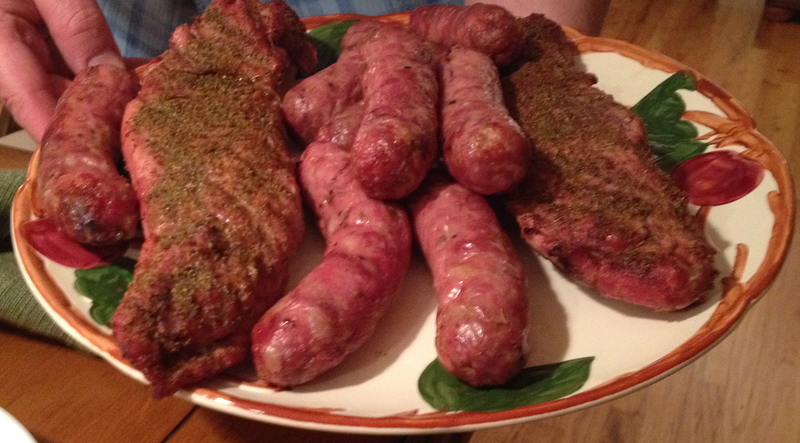 A few months later, Montcalm Imports was doing a tasting and one of the producers was IL Marroneto. I was introduced to the owner, Alessandro and his son, and for the first time tasted their Brunello di Montalcino “Madonna della Grazie.” It was wonderful. 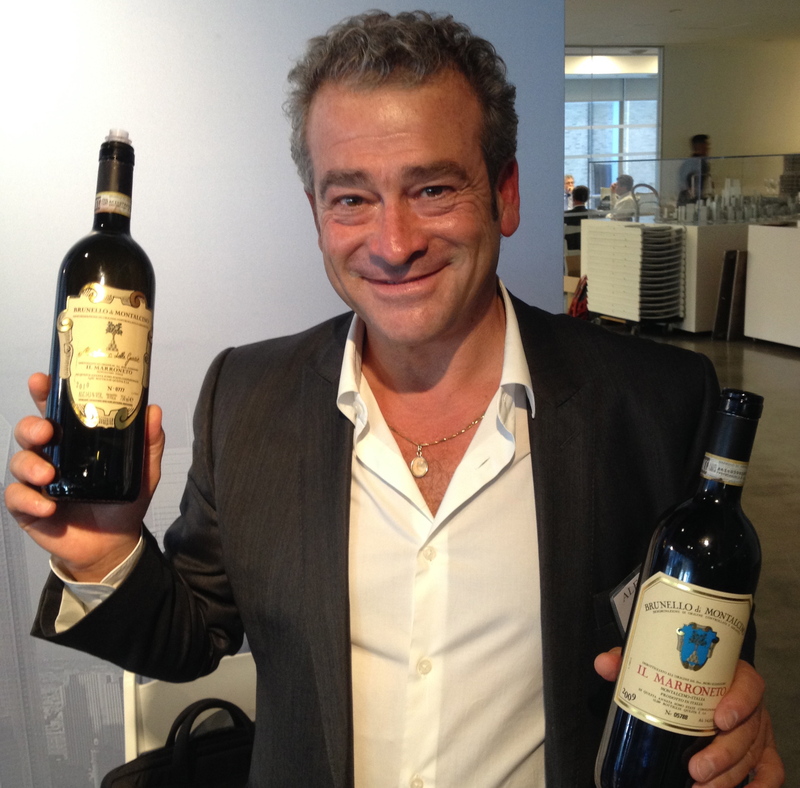 Fast forward a few months and Alessandro was in New York giving a seminar about his wines featuring Brunello going back to 2006. Alessandro said that wine really makes itself and he only does what is necessary. 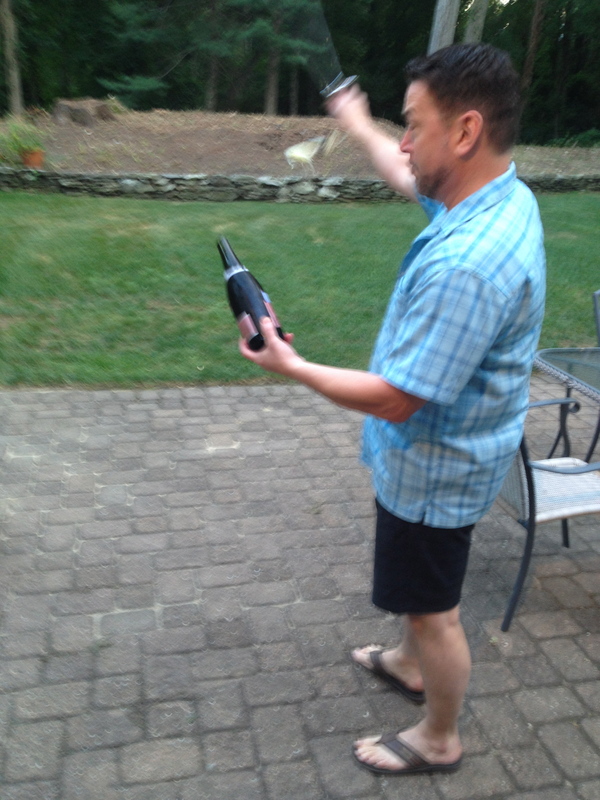 He has a traditional and minimalist philosophy both in the vineyard and in the cellar. IL Marroneto is one of the 10 historical wineries of Montalcino and was purchased in 1974 by Giuseppe Mori, Alessandro’s father. The towers of the city of Siena are the backdrops of the estate’s vineyards located high on the north slope of the hill of Montalcino. The vineyards are between 305 and 400 meters and extend to the walls of the town. This is an area where grapes have been cultivated since the times of the Etruscans. The vines were first planted in 1975 near the church of Madonna della Grazie, (which the estates top Brunello comes from). The original building dates back to 1247. The rest of the estates vineyards were planted in 1979 and 1984. The soil is coarse sandy soil rich in minerals There is natural grass planted between the rows of vines with longer time for pollination and pruning takes place in March. The vineyards are planted for low yields and low density. The training system is spurred cordon. Grapes are harvested only when the stalks start to turn to burnt colors, indicating that the seeds have reached optimum maturity. We tasted 6 Brunellos the 2006, 2007, 2008, 2009 and 2010 Brunello along with the 2010 Madonna della Grazie. 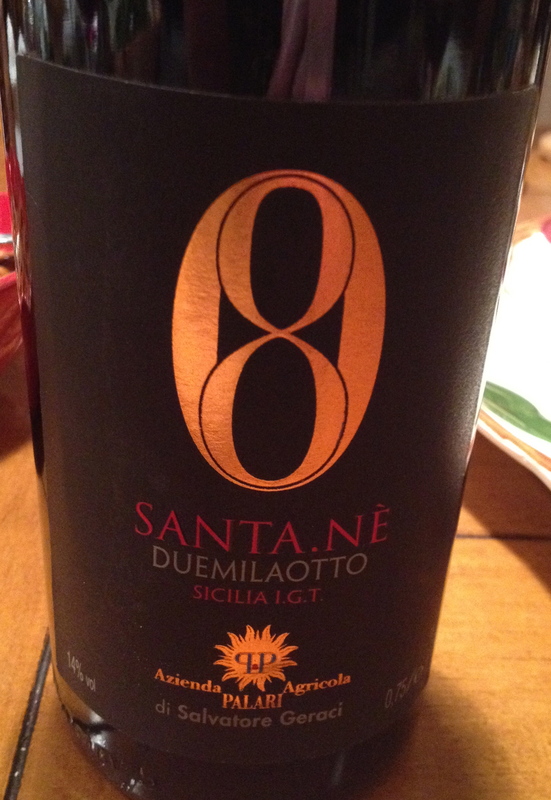 Brunello di Montalcino DOCG 100% Sangiovese. Fermentation lasts for 11/12 days. The wine is aged in 2,500 liter oak barrels for 39 months and 10 months in the bottle before release. All of the wines will last for 20 years or more. These are complex and elegant wines and have a certain easy feel in the mouth that is very pleasing but hard to describe. 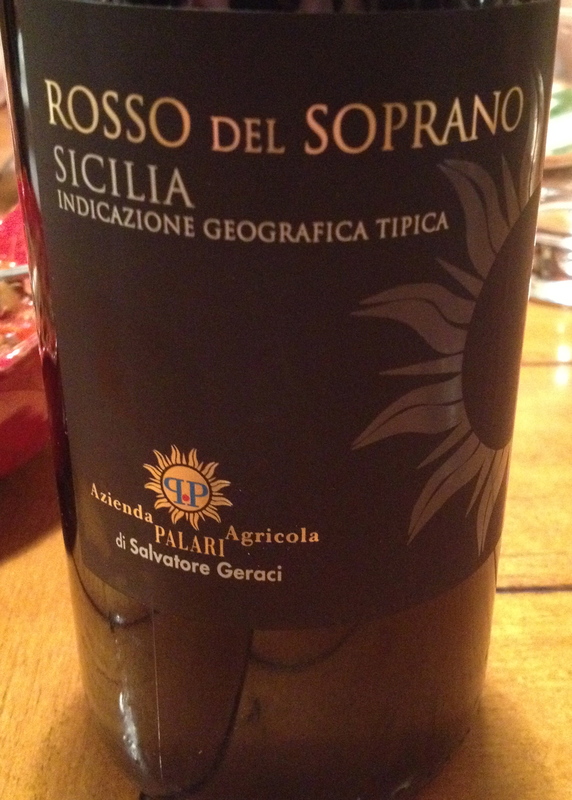 They have hints of black and red fruit, spice, and licorice with a touch of tobacco and leather. They will age for a long time. 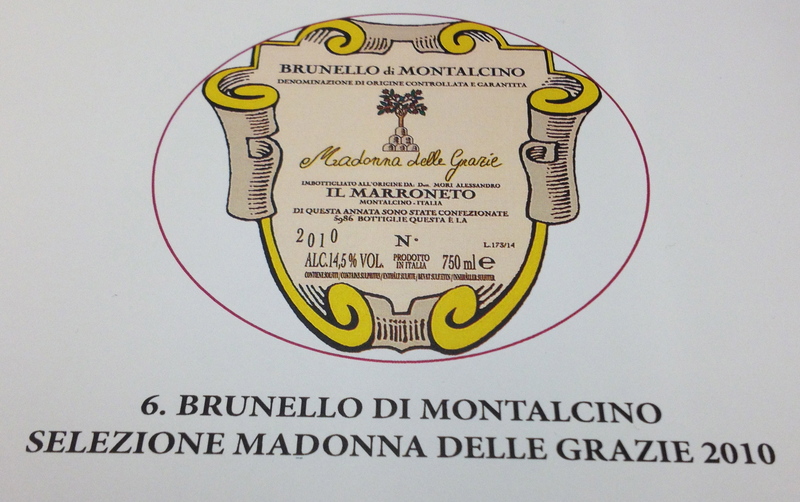 Brunello di Montalcino “Madonna della Grazie” 2010 DOCG 100% Sangiovese. This wine is made from a selection of grapes from the historical vineyard. 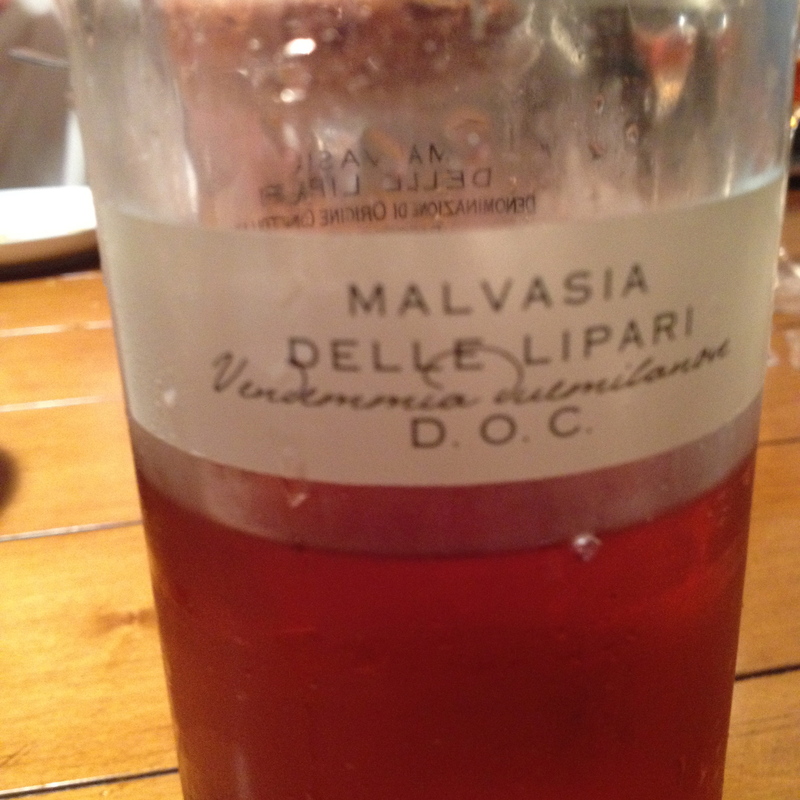 The name of the wine comes from the little 12th century Madonna della Grazie church very near the vineyard. Fermentation is in Allier oak vats where it remains untouched for 2 days and the fermentation lasts for 20/22 days. The wine is aged in 2,500 liter oak barrels for 41 months and 10 months in bottle before release. It a complex and elegant wine with aromas and flavors of citrus, cherry, licorice, mineral notes, and that certain something wonderful on the palate that just keeps on lingering. It has an extremely pleasing aftertaste and a long finish. they are excellent food wines and will age for a long time. Wine writer Monica Larner called this wine “The purest and most profound expression of Sangiovese on the market today and gave it 100 points, the Wine Enthusiast gave it 99 points and Vinous (Antonio Galloni) gave it 97points. I have never done this before, giving other people’s “point scores” but for once I have to agree with all of them and the wine lives up to their praise. 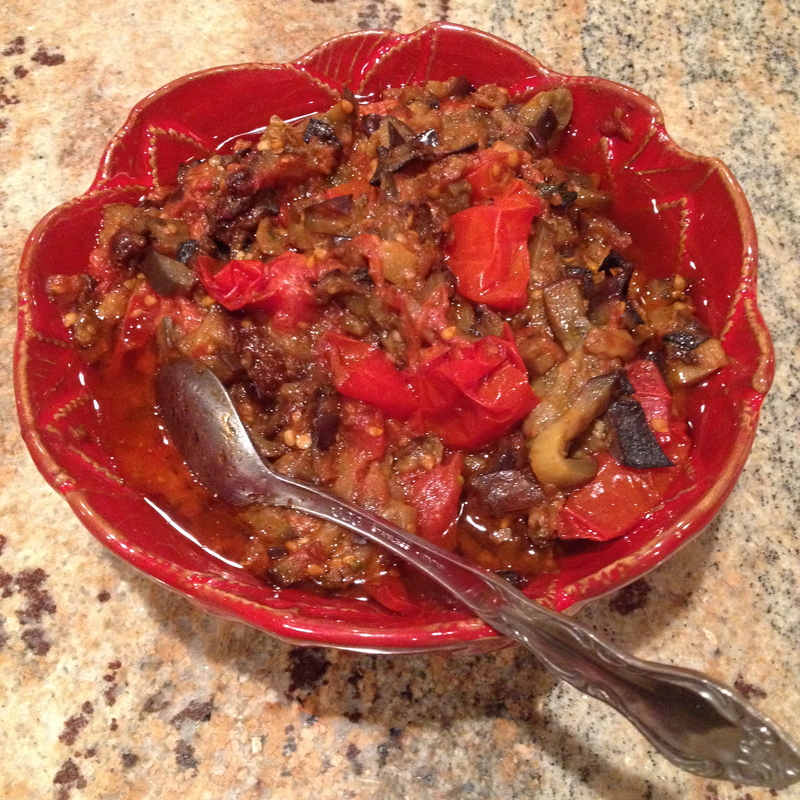 Tom Maresca and Diane Darrow are food and wine writers and bloggers. It is always a pleasure to be invited to their home for lunch or dinner. Diane does the cooking assisted by Tom and Tom chooses the wine assisted by Diane. On a recent occasion, they prepared a 5 course meal paired with a excellent array of wines. 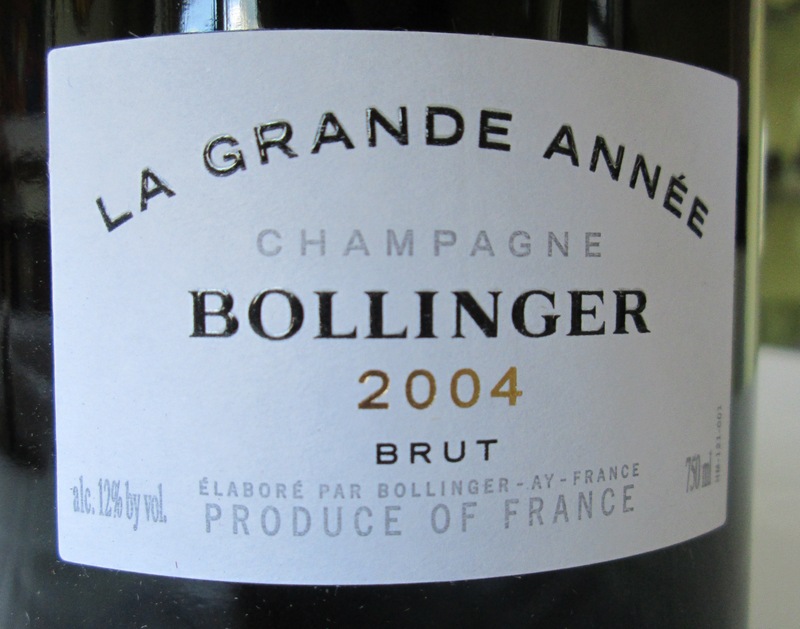 Bollinger “La Grande Anee” Brut 2004 blend of 70 % Pinot Noir and 30% Chardonnay from 13 crus: mainly Ay and Verzenay for the Pinot Noir and Chouilly and Mesnil-sur-Oger for the Chardonnay-95% grand crus and 5% premier crus. There is a moderate dosage of 6 grams per liter. It remains in the cellar for twice the time required by the appellation. This is mature complex Champagne with hints of dried fruit, hazelnuts and pastry. 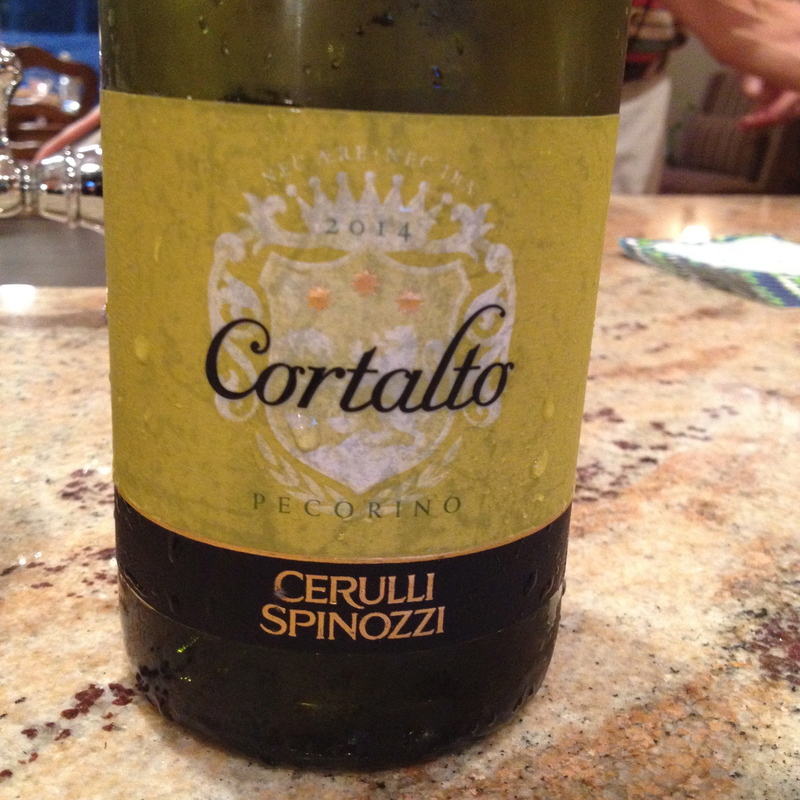 It has a creamy effervescence, subtle acidity and a long finish. Produced only when the harvest reaches a perfect balance. With it we enjoyed Felino salame, Niçoise and Castelvetrano Olives, and Marcona almonds. 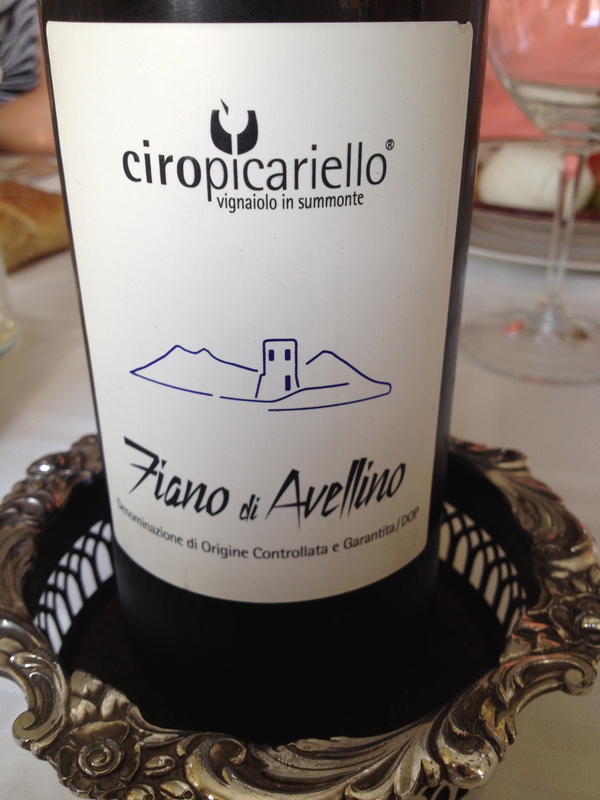 Fiano di Avellino 2012 DOCG Ciro Piariello made from 100% Fiano. The vineyards are in Sunnonte and Monteferdane in the province of Avellino at 500 to 600 meters. The exposure is south-southwest, soil is clay-loam sandstone and the average age of the vineyards is 18 years. Hand harvest in the second or third week of October and the grapes are carefully sorted. Grapes are pressed slowly with only the first press fraction going into this wine. Fermentation for 60 days in stainless steel tanks using indigenous yeasts. The wine spends time on the lees. 12 months in stainless steel and 3 to 6 months in bottle before release. The wine has hints of citrus and peaches and plums with a touch of smoke. Caprese Salad with Mozzarella di Bufala and heirloom tomatoes. 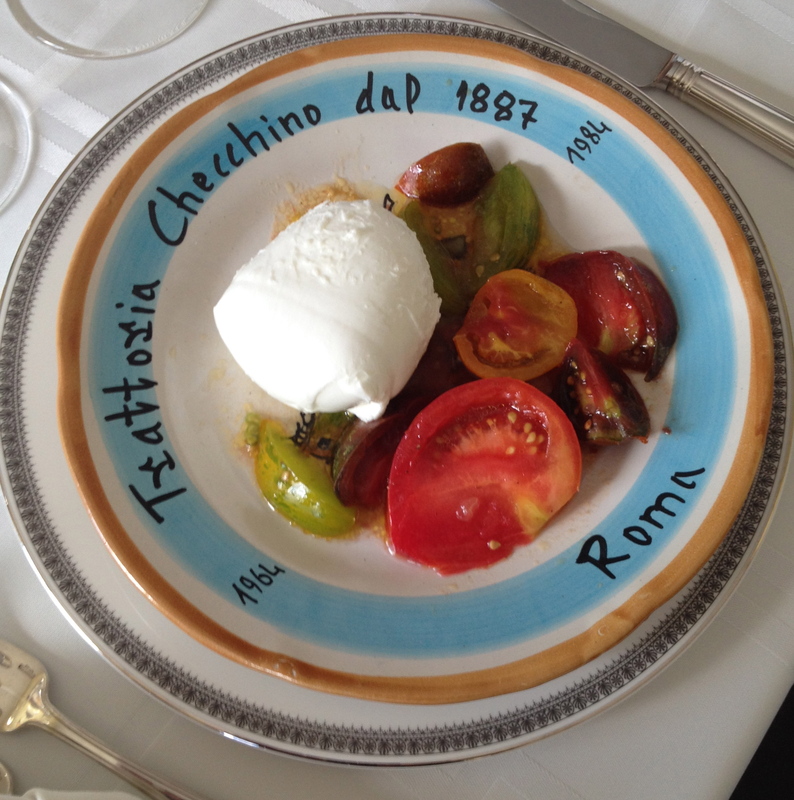 Perfect tomatoes and fresh, tender mozzarella simply dressed with good olive oil. 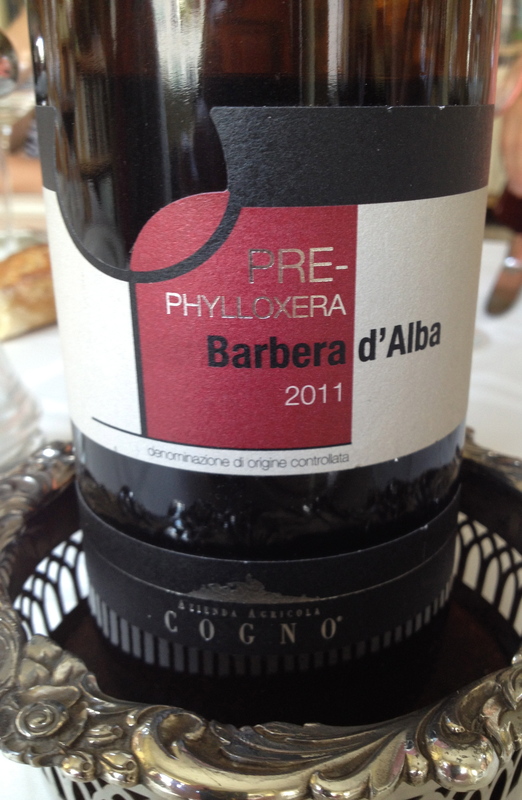 Barbera d’Alba Pre–Phylloxera DOC 2011 Elvio Cogno Made from 100% Barbera. When I visited this winery Valter Fissore the wine maker said that this unique wine comes from a vineyard that is over 120 years old. He rents the vineyard, which is situated in Berri close to La Morra. The vineyard is only 3,400 square meters. The vines are vertically trellised and Guyot pruned and the vineyard is at 520 meters. The grapes are harvested in the beginning of October. The wine is fermented in temperature controlled stainless steel tanks with automatic pumpover. Aging takes place for 12 months in large Slavonia oak casks and another 6 months of bottle age before release. Only 1,800 bottles are produced. 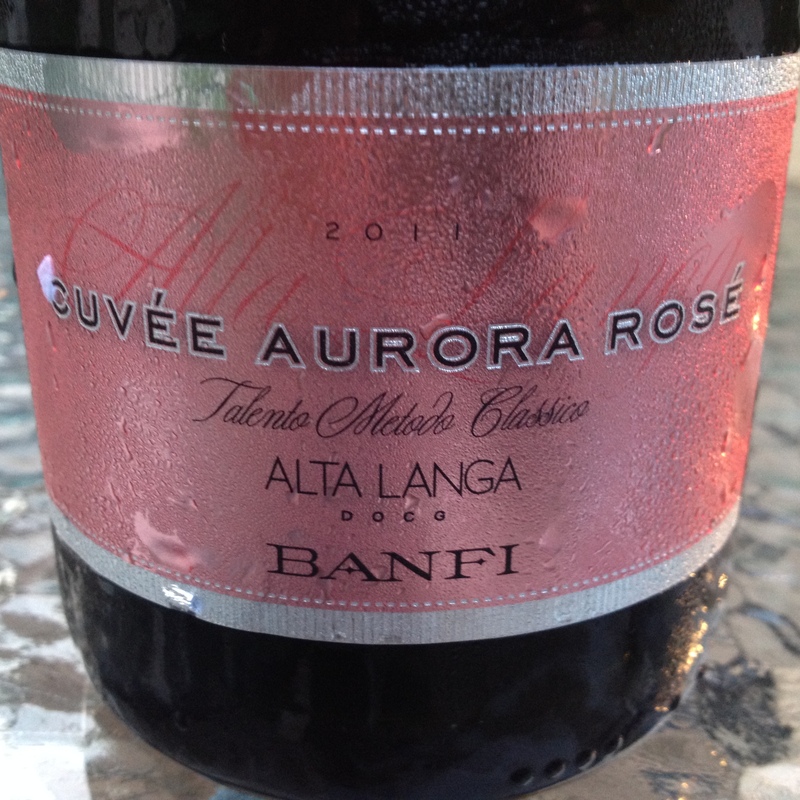 This is an elegant well-balanced wine with hints of raspberry, strawberry and cherry and a touch of spice. 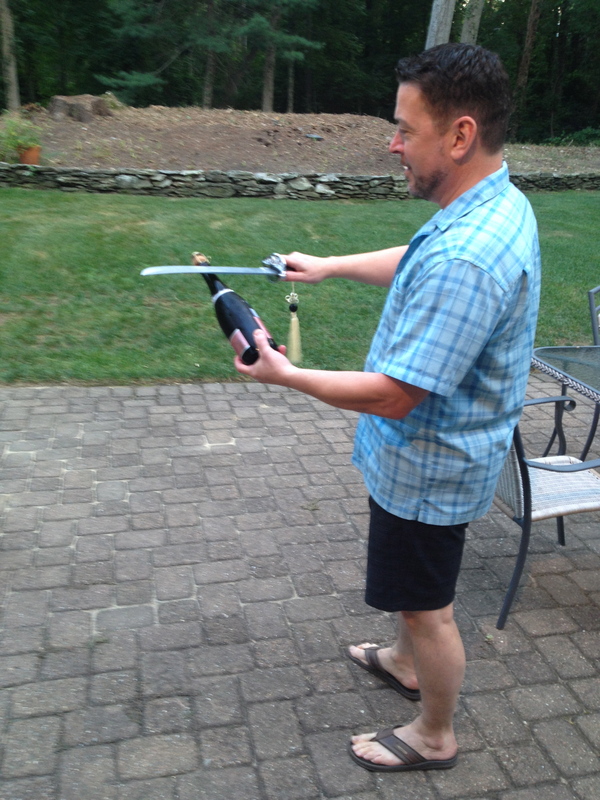 It is a Barbera that will age. I have had this wine a few times before and I am always impressed by it. Valter explained that the vines come from pre-grafted plants propagated by cuttings that have been maintained over many years and therefore they have the original Barbera characteristics. The terrain is sandy-chalk, which is a natural protection for the vines from phylloxera. Valter said that this wine was something he always wanted to make and it is also a tribute to his father-in-law, Elvio Cogno, who made a pre-phylloxera Dolcetto d’Alba “Boschi di Berri” when he was at the Marcarini Winery. 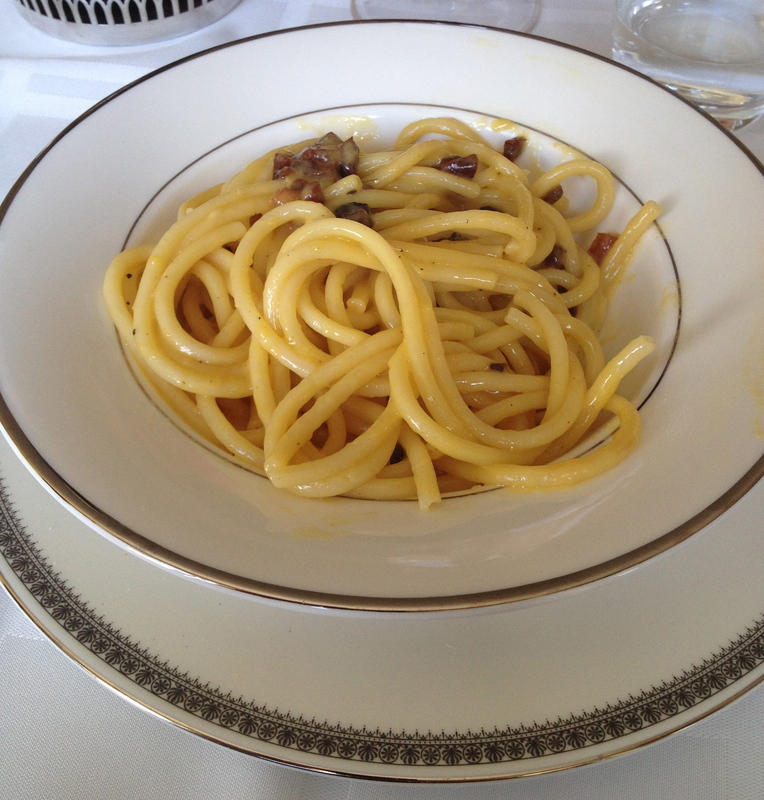 Anna Dente is a renowned chef and Diane used her recipe to make Pasta alla Carbonara, bucatini pasta tossed with eggs, cheese and crisp guanciale. 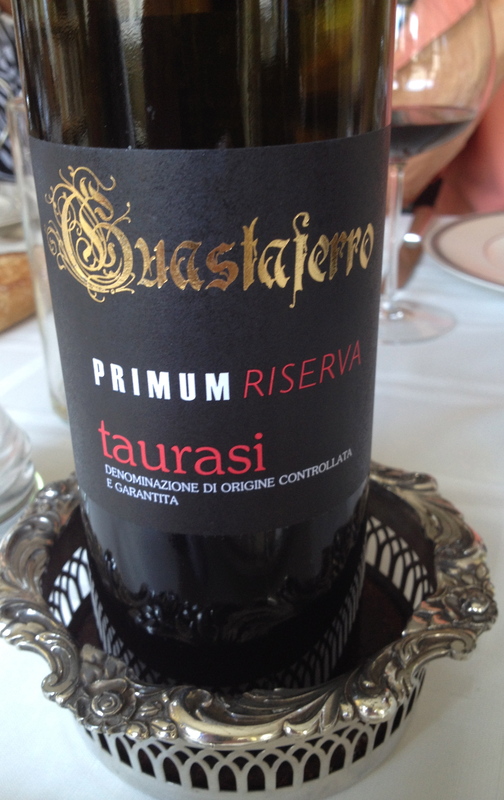 Taurasi Riserva 2006 Guastaferro 100% Aglianico. This wine will be imported for the first time into this country starting this month. 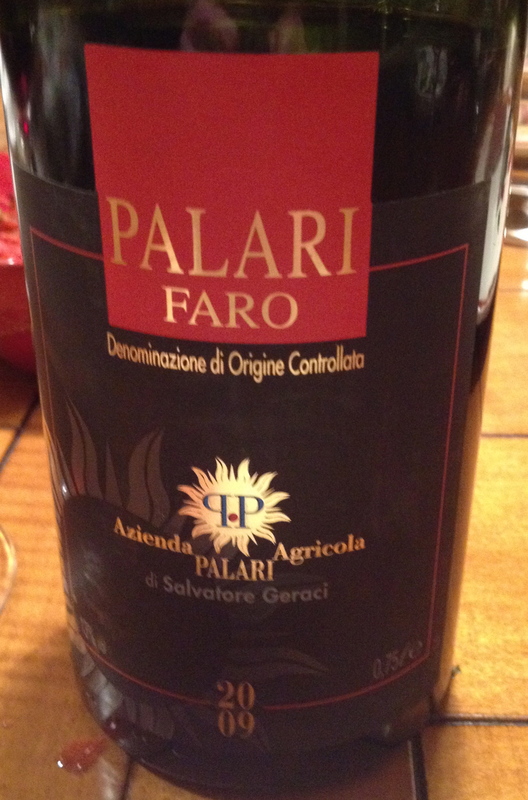 The wine is aged in large barrels (botti) for more then 4 years. 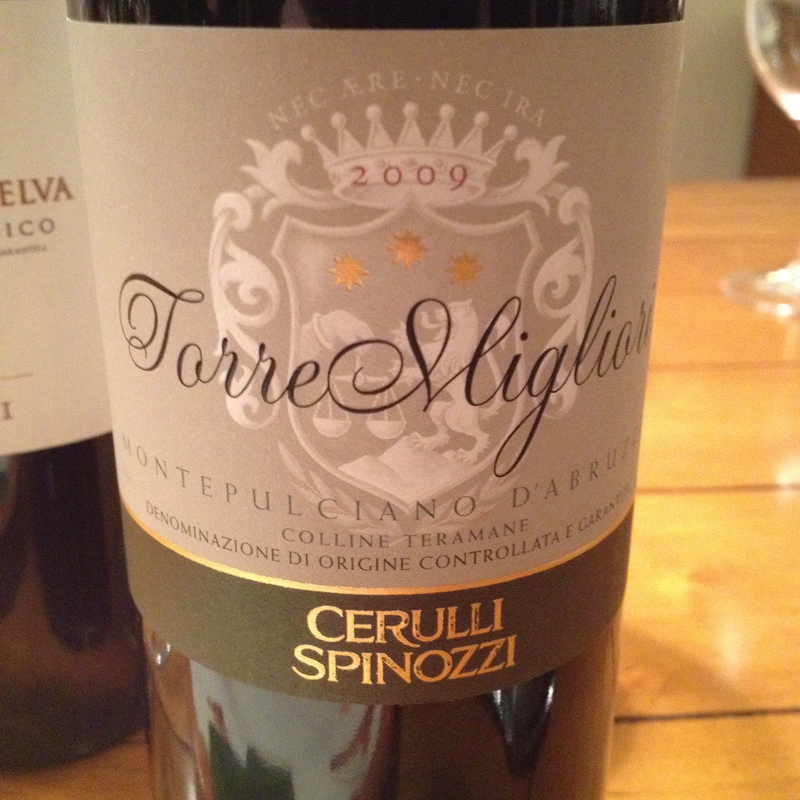 It is a classic Taurasi that will age for many years. 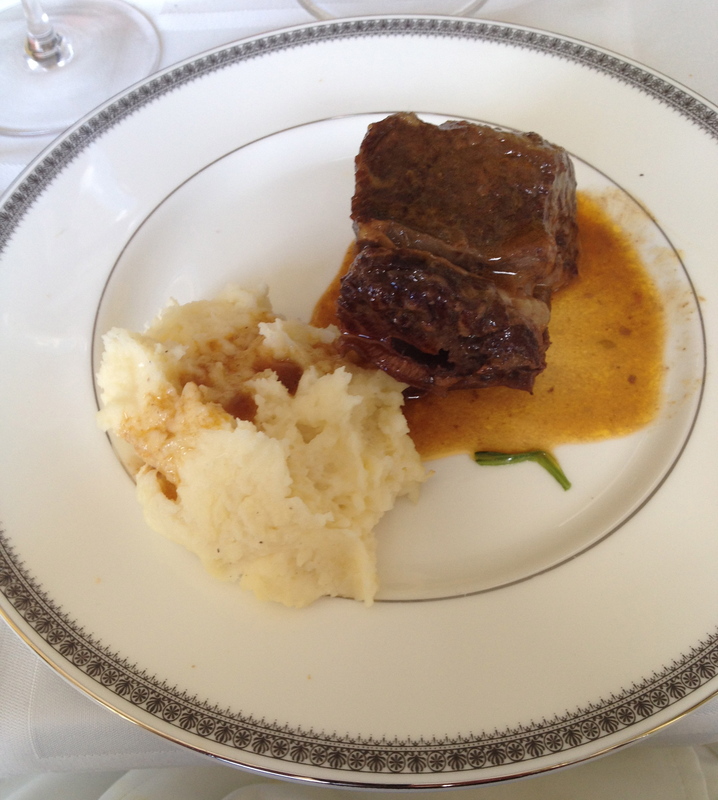 Balthazar’s Braised Short Ribs, Duchess Potatoes, Spinach. The succulent ribs were fall off the bone tender and the potatoes were a perfect foil for the brown sauce. 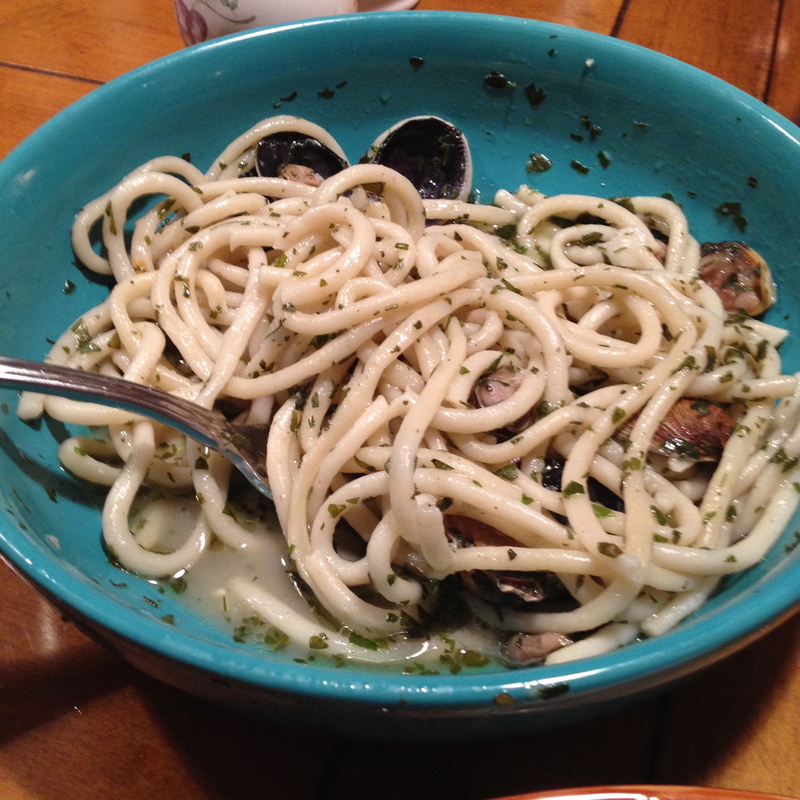 Fresh spinach was a nice counterpoint. 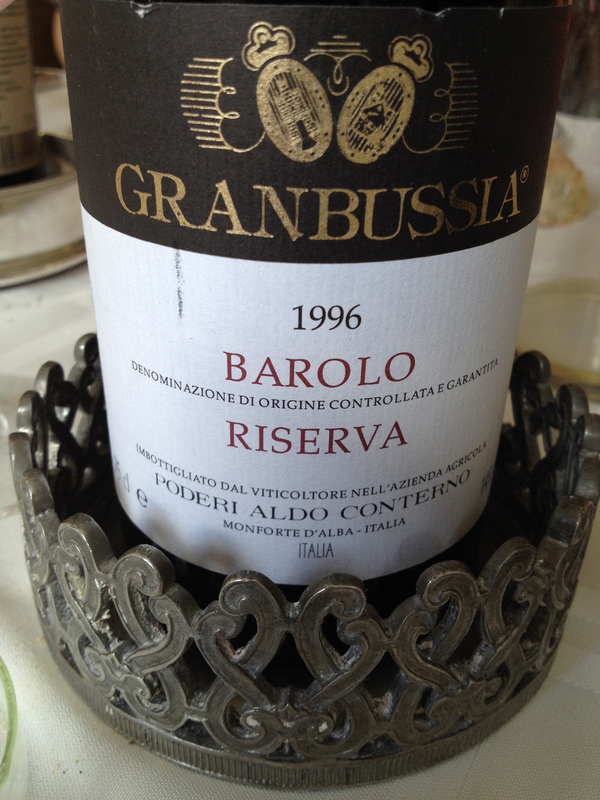 Barolo Granbussia Riserva 2006 100% Nebbiolo Aldo Conterno made from Michet and Lampia varieties of Nebbiolo. Harvest is manual with grape selection in the vineyard and it takes place in mid-October. Vinification is in wood with maceration of the skins in large Slavonia oak casks. The must remains in contact with the skin for 60 days, during which alcohol fermentation is fully completed. The wine is then placed in large Slavonia oak casks for 32 months. The grapes for the Granbussia Riserva are from the oldest vineyards: Romirasco 70%, Cicala 15% and Colonello 15% depending on the vintage. The wine remains in the cellar for 8 years before release and is only produced in the best vintages. 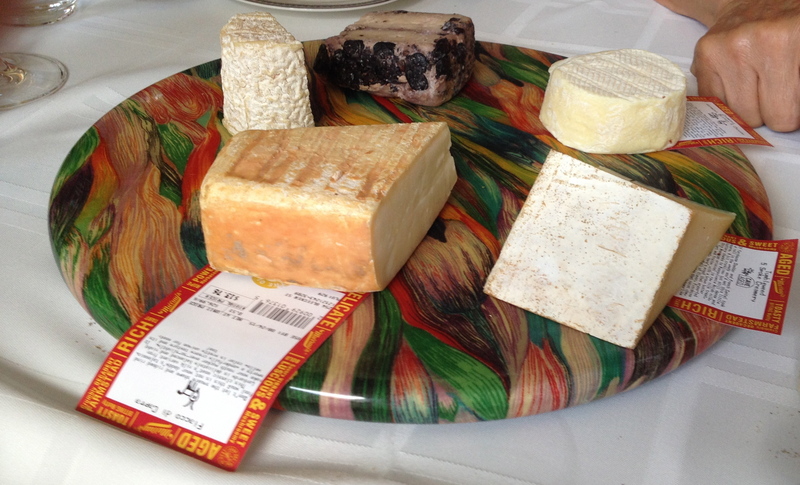 An interesting selection of cheeses included Chabichou, Cremant, Fiacco di Capra, Occelli la Gran Riserva, Tumbleweed. 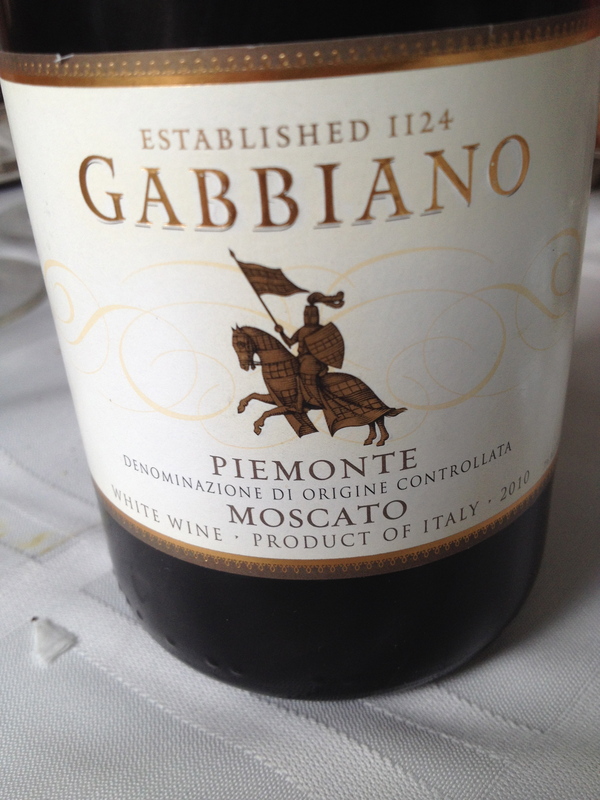 Moscato di Piemonte 2010 Gabbiano 100% Moscato It has hints of apricots, peaches and honey. 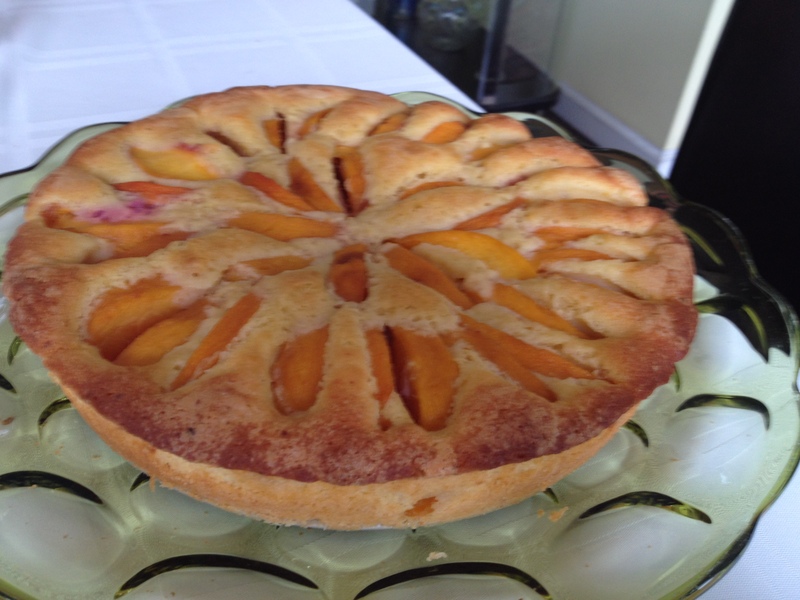 Michele’s Polenta Cake with Peaches from her book “The Italian Vegetable Cookbook” was the dessert, though Diane put her own spin on it by using corn flour instead of corn meal and peaches instead of the original berries. It was a great cake. After dinner Tom always serves grappa, Cognac, brandy and assorted spirits. 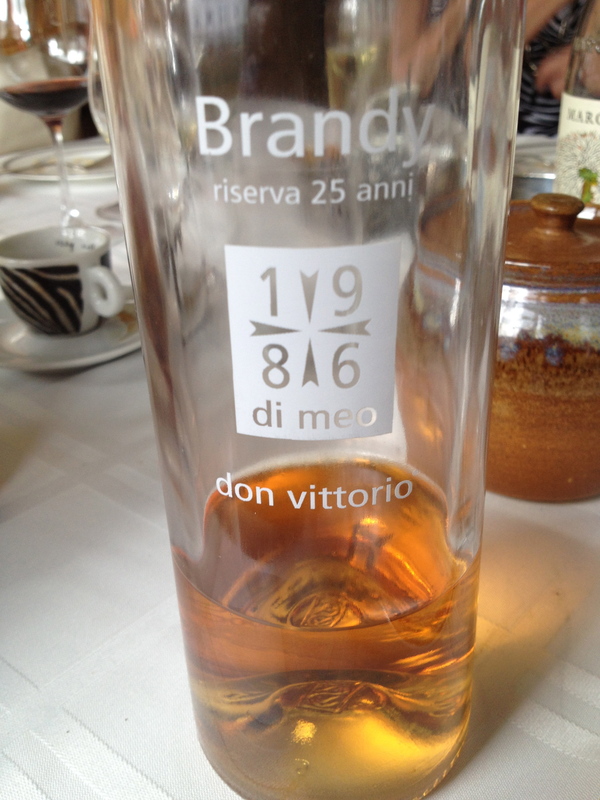 Tom brought back from Campania a brandy made from 100% Fiano, Don Vittorio Brandy from Di Meo aged for 25 years. Classic brandy distillation, discontinuous method in a brain-marie. Smooth with hints of spice, vanilla, coffee and a touch of honey. It was the perfect way to end a lovely meal.